For me, it starts here. You will not see much data without literally leading Googlebot directly to your site and this is the first step. Nearly every platform, HubSpot, Magento, WordPress, Drupal, Joomla, etc, create sitemap.xml files. These are not the same as your traditional "Site Map". They are dynamically generated and I see people all the time talking about how to get their site indexed faster and submitting a sitemap is the easiest way to do this. Once the web server creates the sitemap, it will "listen" for you to add new pages, blogs, products, anything. When it does it will update the site so that you don't have to. Within your configuration on your site, you can usually set a refresh rate, telling Google when to come back, daily, weekly, monthly, etc. Whenever you launch a new website, this will allow you to see if your site is indexed and if so, how many pages are listed. Using the advanced tab, you can also see the number of pages blocked by robots.txt and those removed from the Google index. A large number of blocked pages could mean you have forgotten to remove the no-index, no-follow tags commonly used during development. A large drop in indexed pages show that Google either can’t access your pages or that they are not deemed valuable enough to remain indexed. 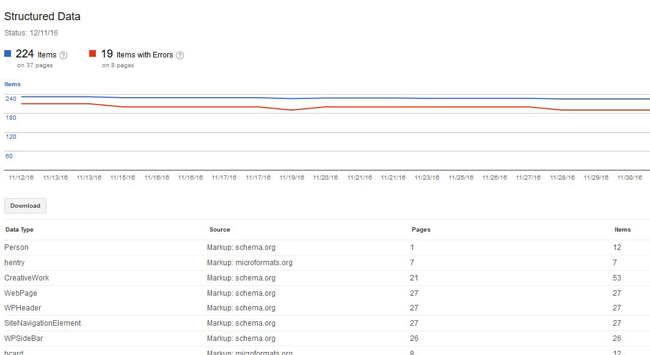 You should check this monthly to see how your site is doing, if new pages are being indexed, and if any pages are accidentally blocking Googlebot. I would recommend adding this to your calendar as a recurring meeting, like when you check your smoke detector battery. Do you have a few pages that are really important to your website? Are they close to the homepage? If not, crawl stats can show you how many pages Google visits on average when they come to your website. In the example below, you can see the average number of pages crawled is 11. If you happened to have really important pages 4 levels from the homepage, it is possible they are being crawled often. While many people tell you to post often on your site or blog, they leave out the effect it has on your crawl rate. If you publish five great new articles each day, your crawl rate will be higher than if you post once per month. Recently, Google announced that using “no-follow” directives would not conserve your crawl budget, a common belief among many SEOs. 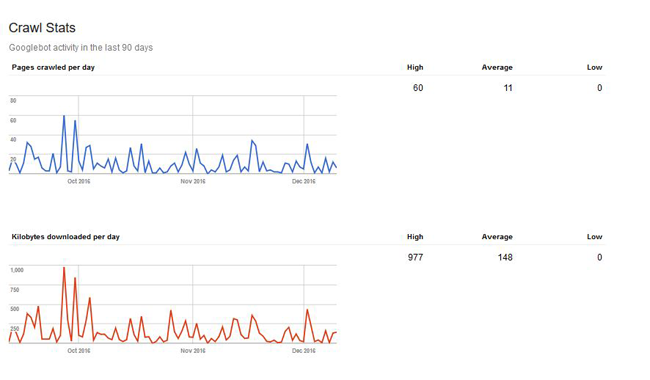 Long story short, check your crawl stats to see how often and how deep Google is crawling your site. If they aren’t going deep enough, you need to look at your site structure and rate of content updating. This is a critical indication of your overall inbound link strategy. As of this posting date in February of 2017, inbound, credible links are still key to SEO/SEM success. Google still builds it's massive indexes by relevance so if you are a real estate agency in Miami, Florida, you should have links from directories and other reputable sites from "Real Estate Agencies Miami". This is an onging and pretty challenging part of your marketing mix, but it cannot be overlooked. This part of your search console will give you a look of how many sites link to you. Not every link built to your site is going to get picked up by Google, even so, they may show up in third-party tools. Using this section will help you see your link profile as Google sees it. Internal links are any links connecting one page on your site to another page. Internal linking structure is often pushed aside to talk about other SEO methods, but it is extremely important. Let’s say you have one page on your site that is the most important to rank for, you would want that page to have a lot of internal links from other related pages. This increases topical relevancy and sends “link juice” to important pages on your site. Aside from the ranking benefits, internal links are also important for helping people navigate your site. If you start them on a blog page, you can link internally to a service page. This advances them through your funnel and presents them with information they are likely seeking. You should also link to other pages that further explain or build upon key points of a page or post. This will guide users through the learning process, keeping them on your site longer, making them more likely to take action on your CTAs. Think of this section as your cheat sheet. It covers basic improvements that can be made to your site. This includes listing duplicate titles, meta descriptions and non-indexable content on your site. When your new site is fully indexed or you are improving an existing site, looking here can give you a punch list of items to fix. Structured data allows Google to better understand the content on your website. I have found this is critical for eCommerce sites and product data. If you are a restaurant, this could be hours or reviews. A movie theater would markup show times and dates. The content of your site will determine which structured data items you will need to incorporate. You can set up structured data using the Google Structured Data Markup Helper. Once you have markups in place, check the structured data tool periodically to ensure your information is properly labeled. This is especially important when using plugins for WordPress that automatically generate Schema markup. For businesses with relatively flat content, this may not be as important. After Google has crawled your site, you can check this section to see if they found issues with your site. 404 pages are not necessarily bad, but if you have a lot of internal links to 404 pages, it can cause the Googlebot to hit a “dead end” of sorts and with only a limited number of pages getting crawled daily, you don’t want to waste your “crawl budget” on 404 pages. If a 404 page is similar to another page on your site, set up a redirect to send users to the new or most relevant page. If you have links to a 404 page, you should 301 those to the homepage to preserve “link juice." Otherwise, just leave them alone and let Google remove them from their index when they update. This is has changed so many times, year after year. Google has all but removed all keyword data but this tab continues to give you insight. You can also discover pages or keywords that you may not be aware of performing well in search. You can see clicks, impressions, click through rate (CTR), and average position for some keywords/pages. Another use would be finding keywords just shy of sending traffic to your site. Look for keywords with an average position between 11 and 15. Improving the rankings for those terms just a few spots can lead to a boost in organic traffic. Google accelerated mobile pages is the next iteration of playing well with them in the playground. It is very technical and certain platforms (HubSpot) will start adding the markup language to their systems early this year. I will assume that competitors like WordPress, Magento, Joomla and others soon may follow with their own plugins. Using AMP markup will markedly decrease the load times of your content on mobile devices and we all know how frustrating it can be when we are standing in the rain or snow, waiting for content to load on our handheld devices. For more on AMP, you can read up here. I have blogged about the importance of this in a previous post and this is another place where you can see the "health" of your robots.txt file, that is if you have one. This section will display the way Google sees your .txt file and let you know if there are any warnings. These 11 functions listed above are pretty simple to use, but they can make a big impact on the overall rankings of your website when used to make corrections and improve the quality of your website. If you haven’t already, I suggest reading through all the features of Search Console and how to set up data sharing with Google Analytics.